Boston Fan Expo 2018 – Comics, Toys, LEGO, Cosplay, & More! I went to the Boston Fan Expo (Boston Comic Con) on Sunday August 12th, 2018 and shot footage of all kinds of trinkets and randomness. The staff at this show is awesome, and it’s a great time! Alex wasn’t at Boston Comic Con this week but Joe was, so the two geeks sit down and have a bit of a chat about that… and not too much else. For every action, there is a reaction. Well, one might ask why in a star-studded convention that featured William Shatner, John Barrowman and numerous television and film alumni, that why was the longest line of each day for writer/artist: Amanda Conner? That’s simple right now she is at the helm of the hottest property in the comic book world. Add that to the fact that Amanda Conner just so happens to be one of the nicest people across this or any Multiverse and the picture becomes as clear as Susan Storm’s wardrobe. I was thankful enough that she took time out of her very busy schedule, and I mean that as a gross understatement (seriously I’ve seen amusement parks with shorter lines) to talk about everyone’s favorite maniacal she-devil turned anti-hero phenomenon: Harley Quinn. Graphic Policy: So hello, it’s very nice to talk to you today. As you probably guessed I’d like to talk to you about what brought you here today, Harley Quinn. GP: Did you ever think that a character who started off so simple, was going to bring all this about? Amanda Conner: No, we had no idea. When Jimmy (Palmiotti) and I said yes to writing and for me, writing and drawing the covers to Harley Quinn just thought “Oh this is going to be a lot of fun” but we never thought it was going to explode the way it did. So we are pleasantly surprised, to say the least. GP: I’d say we are all pleasantly surprised. Who were your artistic influences when you guys decided to hop on Harley Quinn? Because she had been done before. What style held inspiration over you? Amanda Conner: That’s right. Well, definitely Bruce Timm! We were trying to have somewhat of the look Bruce, gave her and at the same time modernize her a bit. It was important that we bring her back to her original personality and love of life and of course death (laughs). As far as other artistic influences for her, I’d have to say it was more movies than anything else. I drew from movies like Fight Club and stuff like that. I guess it’s a cross between Bruce Timm, Fight Club, and Tank Girl maybe. GP: That’s a pretty interesting inspiration mix right there. Amanda Conner: Ha ha, yeah we think so. GP: Do you have a favorite Harley story yourself? Amanda Conner: Oh geez there are a lot of them. A lot are my favorites. Y’ know one of my favorites, I’m going to actually go with one that isn’t my own. I can’t remember the name of it but it was one of the Christmas specials, where Harley and Poison Ivy kidnap Bruce Wayne and Ivy uses her lipstick to put Bruce under a spell to take them shopping. That was so fun! GP: That was a great one. It was actually the Batman Adventures Holiday Special and Bruce Timm did that one. It’s classic. It’s fantastic. Amanda Conner: Yes that’s definitely one of my favorites. GP: As a matter of fact, Paul Dini did that one too. GP: Speaking of Paul Dini, that’s someone who gives you guys great praise for how you handle Harley and the character. Coming from that source what does that mean to you? Amanda Conner: Oh we are so flattered by that. It’s so nice to have a nod of approval from the guys who are her (Harley) “dads”. They are the ones who created her. GP: Pretty much. Absolutely. It’s amazing the level of success that you’ve added to her already booming popularity. It’s also very cool that the Harley Quinn fans see brought to life in the movie Suicide Squad, is essentially your interpretation of Harley. GP: Oh she certainly is. I would think that everyone in this line would agree. Amanda Conner: I’d say so too. GP: Last thing. I would just like to let you know, I have done a lot of these before and from a personal standpoint, I just have to say I have spoken to a lot of people today and the response has been overwhelmingly positive. It’s because of people like you, that you have ensured that this will continue to grow and go on. Amanda Conner: Oh wow. Thank you so much. That is so wonderful to hear. GP: Well I thank you for your time and see you in the funny pages. *Graphic Policy would like to take the time to thank Amanda for signing the Harley Quinn action figure we donated to the patient folks in line. We have no doubt it found a nice and appreciative home. 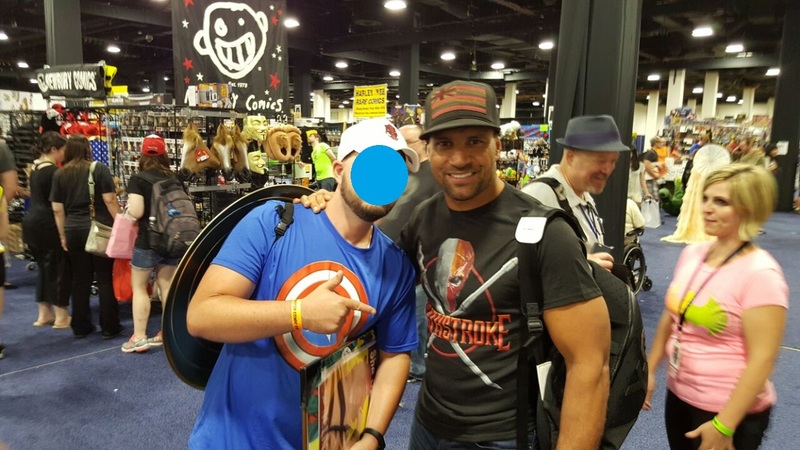 Boston Comic Con 2015, Snyder, Lee, and a lot of Cosplay! Yesterday I had the distinct pleasure of stepping into the transformed halls of the Seaport World Trade Center in Boston, MA as it became hallowed ground, Boston Comic Con. For three days this piece of property became a haven for geek and nerd alike as they celebrated like no others. I am proud to say that I was not above the fray and Sunday I joined in the festivities as well. 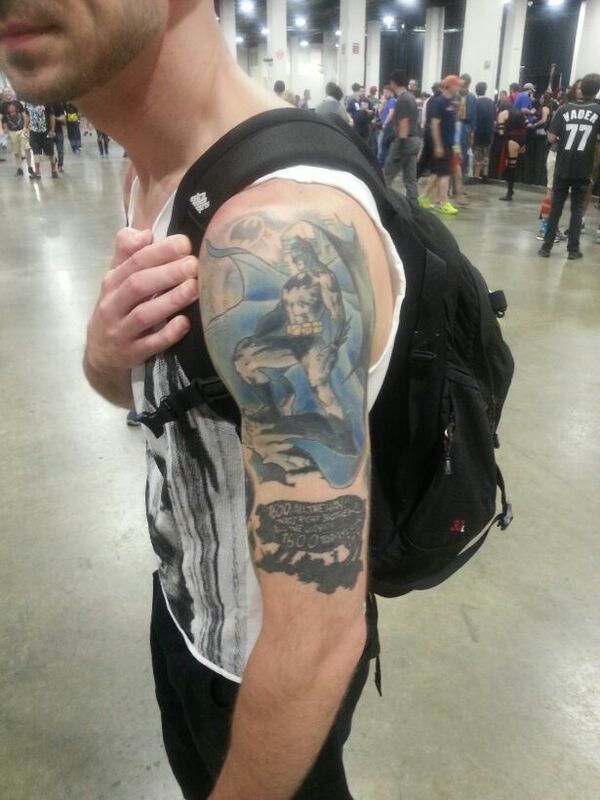 Now I have been to a few Comic-Cons before but this one was something special. I like many of the folks, went in with the intent of meeting the Man among Gods in comics, Stan Lee. That’s right, Stan Lee. You heard me correctly. To realize that I was going to be sharing the same air as the man who brought us Spider-Man, The Avengers, The Fantastic Four, X-Men, The Hulk and so much more, was a distinct honor. To say I was jacked was an understatement. However that was the main event, and there was oh so much more to go. 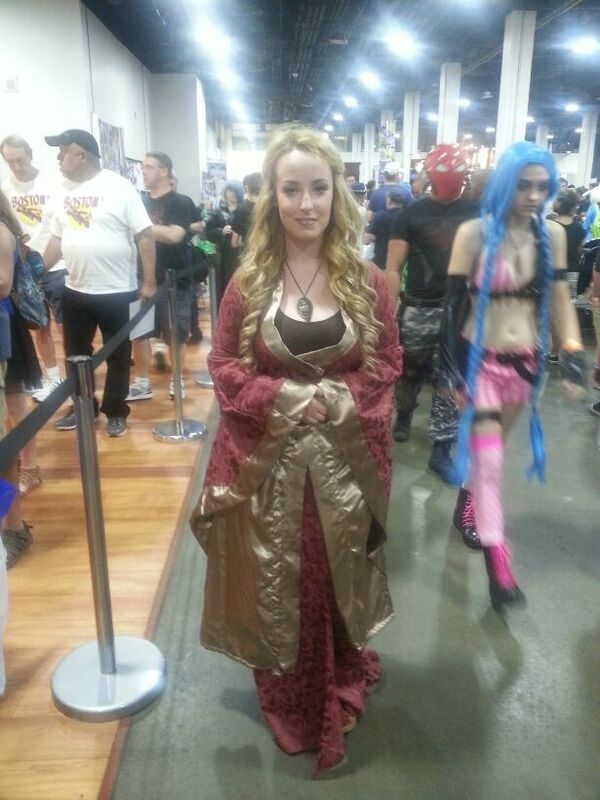 Countless cosplayers weren’t the only ones who were turning heads this day. I had the great pleasure of sharing the Con with not only close family (you catch him on his own blog at Steven’s Sport Central) but also a very good long time friend Jon Costanza from Arlington, MA who would give both his arms and then some for his passion of comics. 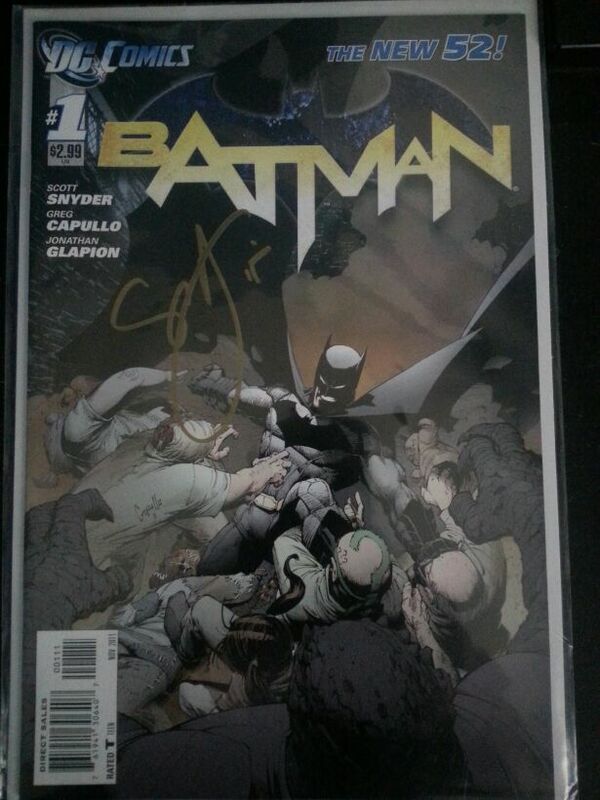 (Not to mention he has some of the coolest ink I’ve ever seen) Jon and I had the chance to meet one of the all time greatest and current scribe on DC Comics’ main Batman title: Scott Snyder. 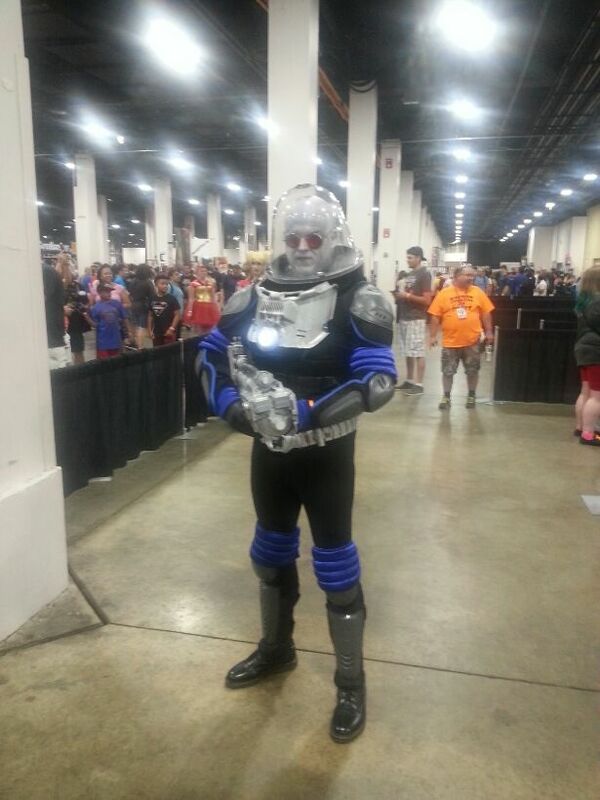 Once I finished there and was able to get my bearings back, it was time to venture around the Con floor. There was everything: vendors, artists, memorabilia, paraphernalia, you name it, and it was there. I spent some time looking for some Ant-Man collectibles and to my surprise there was not much. I figured with the recent movie it would be booming. I guess he’s still small time. (Sorry for the pun Scott Lang, you’ll make it yet) I did however procure a very sweet Pym Technologies T-Shirt later in the day though. Something that was very popular this year which I did not foresee was a lot of Agent Carter merchandise. Must be something due to that Hailey Atwell who plays her. She seems like a nice lady. Many cosplayers took up the red hat charge, but unfortunately none of them wanted to be photogenic, so you will just have to take my word for it. A couple of pics snapped and some handshakes exchanged, it was now time. I slung my shield over my shoulder, drew a deep breath and went into the main ballroom to be in the presence of greatness. To my surprise I was one of the first in line. I thought hmm this ought to be very quick. Alas I was wrong, it was almost two hours later before I would see him enter. Now mind you I was waiting with some very hospitable and wonderful people in line, whom I enjoyed conversation with. However the actual process of meeting Mr. Lee was torturous. So much misinformation was exchanged, and the people who guarded the line took themselves way too seriously that they were almost a caricature of their hired position. Nevertheless I was so close, nothing would deter me. I was beginning to feel like Indiana Jones in Raiders of the Lost Ark as I inched closer to the table. This was my time and this was what the day was about. It should be noted that you will hear many different stories and opinions on meeting of him, but I will say my brief time with Stan Lee was what it needed to be. Would I have loved to have a private meeting where I could pick his brilliant brain about how he came up with the ideas that have revolutionized over a half century of Comic Books? Well, of course I would. This was not that day though. I had to be a realist. Stan Lee is not only the ICON in all of Comicdom, but he is 92 years old. The fact he still even does this is a testament to the man himself. 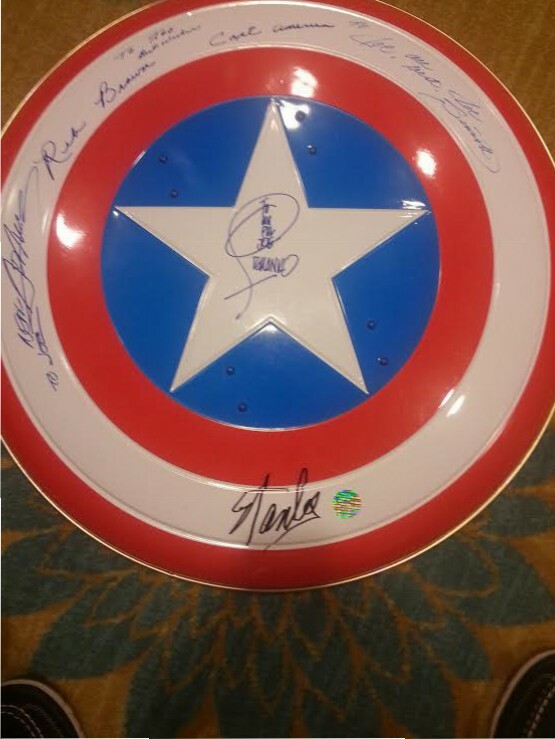 So I gently held out my prized Captain America shield, he drew his pen and asked “Where would you like me to sign young man?” I was speechless, he used that voice of a caring grandfather and I humbly replied “Where ever you may like sir.” The black tip of the sharpie then pressed against the metal of my shield, and history was made. 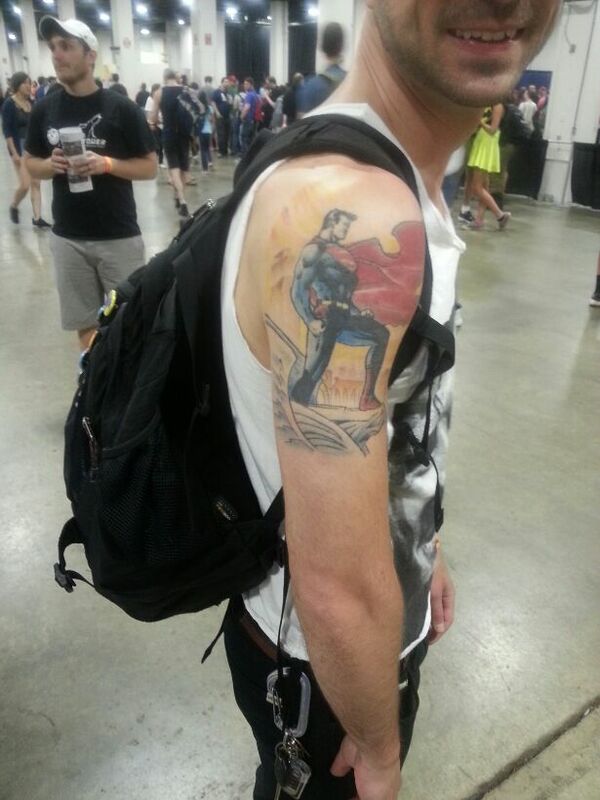 His name then joined a pantheon of who’s who in Marvel Comics history and my mission was complete. I shook his hand, let him know it was my honor and then it was done. It was a moment so brief, yet also completely memorable. Unlike the valued collectible I now held in my grateful hand, it was also priceless. I can say I met the man who shaped my love of this entertainment medium for all my life. I met Stan Lee. I did the only thing I could, I placed the shield down and gazed upon it’s beauty. It was all over. Time to go back to the real world and real life. 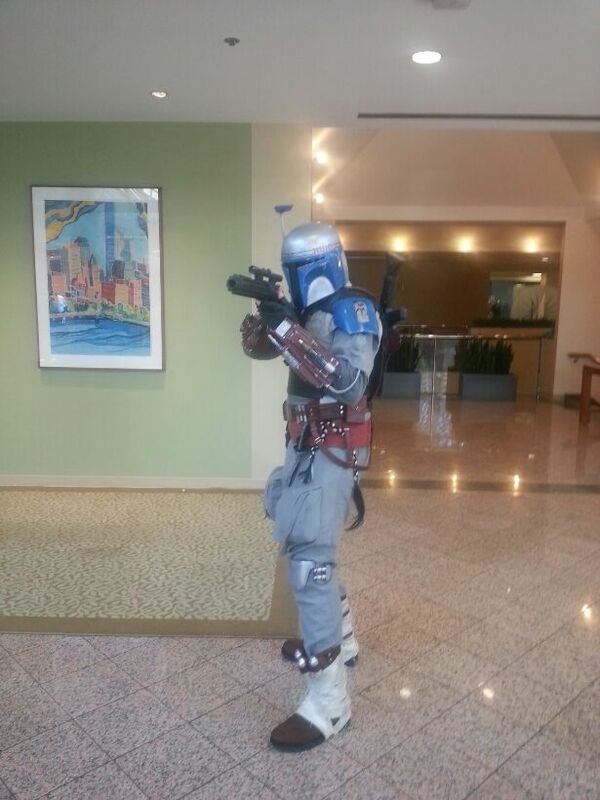 So I gathered my things and head down to the main lobby to make my way to the booths for the remainder of the Con. What I saw when I reached the bottom put a large smile across my face. Why what is this? 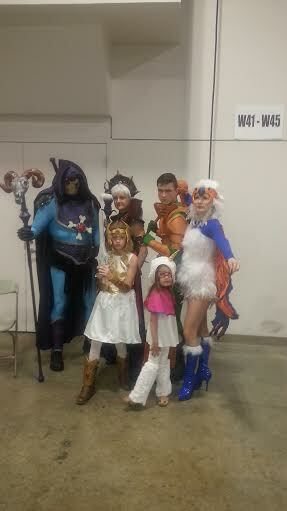 It’s a family of cosplayers dressed as the cast of He-Man and Masters of the Universe. 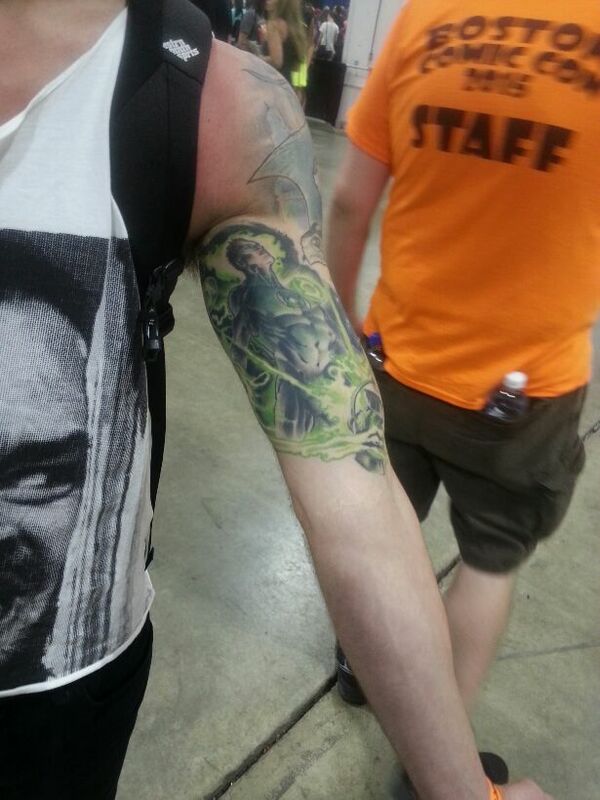 This here is just proof that being a geek knows no age or bounds and I loved it! The remainder of day was spent just perusing the booths and grabbing some comic books. It was all very draining. 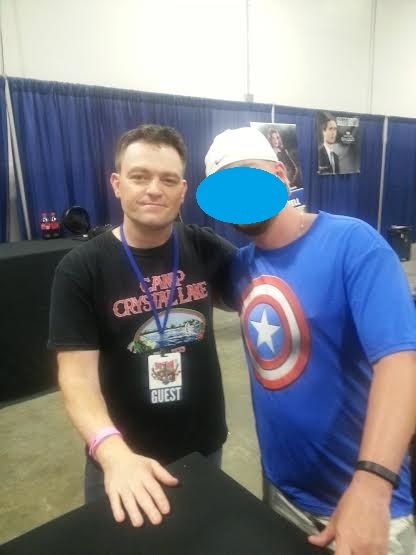 After all you have had a day where you broke metaphorical bread with Scott Snyder and spoke words to Stan Lee, what could possibly be left to surprise you? How about a quick impromptu meet and greet with resident Arrow badass, Slade Wilson himself: Mr Manu Bennett? He was on his way out but took the time for a quick exchange and some banter. Just a cool experience made even cooler. 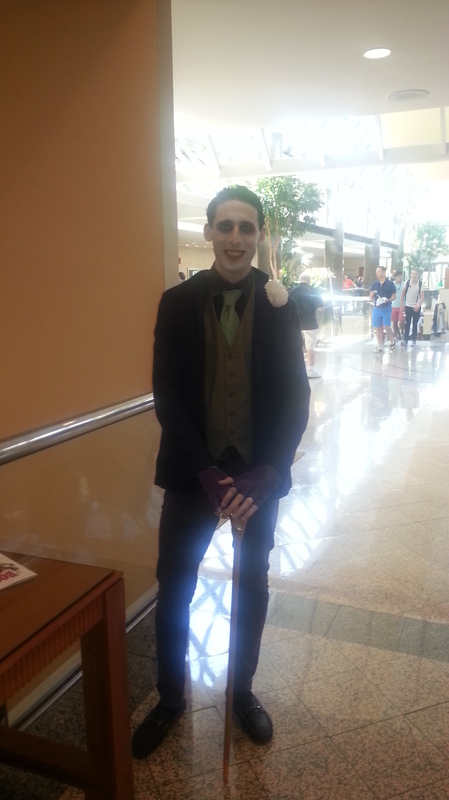 My cousin also friendly stated said he liked him for Season 1 but then he killed Moira. To which Mr. Bennett replied “Yes I did and it was glorious!” Ha. What a great quote. A perfect one to sum up the day too. Many people always say to be weary when meeting your heroes up close, well I’m happy to report that it wasn’t the case for me. In fact, other than the capes and bright costumes I don’t see much of a difference at all. Thank you each, Mr. Snyder, Mr. Bennett, and Mr. Stan Lee for making my Boston Comic Con experience a very Excelsior one!! This weekend, Valiant is heading to Boston Comic Con – and we’re bringing along a boatload of surprises to celebrate! From Friday, August 8th through Sunday, August 10th, join Valiant at Booth #C618/C619 inside Boston’s Seaport World Trade Center for a weekend packed with con-exclusive giveaways, panel appearances, and signings from special guests, including acclaimed artist Robert Gill and more! Plus: don’t miss out on Sunday, August 10th as an all-star panel of Valiant staff and creators present Valiant First: RAI, Armor Hunters, and Beyond at 5 pm in the Amphitheater! Find out everything you need to know about Valiant’s biggest year yet right here with an exclusive round of news and discussion about RAI, Armor Hunters, The Delinquents, The Death-Defying Dr. Mirage, and the rest of Valiant’s power-packed Valiant First publishing line-up! And get your first look at The Valiant – Valiant’s all-new prestige format mini-series arriving in December from New York Times best-selling writers Jeff Lemire and Matt Kindt and Eisner Award-winning artist Paolo Rivera! Zenescope Entertainment has announced its tour dates for the 2014 Age of Darkness Tour. Age of Darkness encompasses their Grimm Fairy Tales series which features classic characters and locales (Wonderland, Neverland, Oz, Robyn Hood, Red Riding Hood, Van Helsing, Captain Hook, the Dark Queen, etc) that have all been operating in their own titles. Age of Darkness books bring these characters together in a modern setting for a story that will have an impact the Zenescope titles across the board. The culmination will be in Grimm Fairy Tales #100. Let the countdown begin! Boston Comic Con 2013: ComixTribe Announces SCAMthology! At this weekend’s Boston Comic Con, ComixTribe announced SCAMthology, a new project expanding Joe Mulvey‘s Scam universe, featuring top and up-and-coming comic talent telling thirteen new stories featuring super-powered con-men taking Vegas for all she’s worth. The full roster of SCAMthology creators includes Joe Eisma, Ben McCool, Nick Pitarra, Paul Allor, Brian Shearer, Tyler James, Adam Masterman, Rich Douek, Daniel Logan, John Lees, Doug Hills, Aaron Houston, Kirk Manley, Josh Flanagan, Alex Diotto, Jonathan Rector, Jamie Gambell, Amy Chu, Nolan T. Jones, Steve Colle, Ryan K Lindsay, Alex Cormack, Steve Forbes, and Daniel Picciotto. That’s thirteen teams, all tasked with developing the Scam mythos. And that’s an impressive line-up. The first four-issue Scam mini-series concludes this November with a double-sized final issue, and SCAMthology will follow directly after. ComixTribe has created a special SCAMthology Tumblr Page that will feature frequent teasers and more details about the project over the next few months. SCAMthology is set to be released in early 2014. F or its first appearance at Boston Comic-Con, IDW will be bringing the talented creators of Locke & Key and their collaborators, as the celebrated series opens the door on its final chapter, Locke & Key: Alpha. 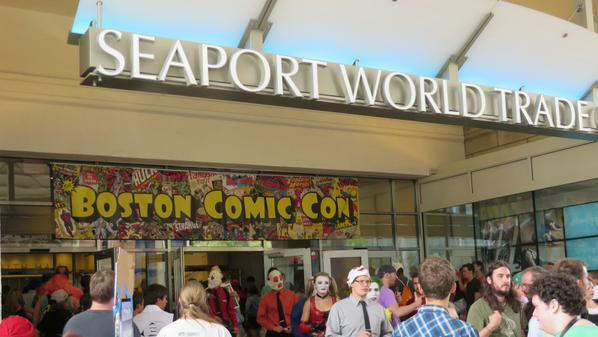 Boston Comic-Con will be held at the Seaport World Trade Center on August 3 – 4, and IDW will have some special surprises for the attendees! In addition to the Locke & Key gang, writer Jason Ciaramella and Hill’s newest collaborator Charles Paul Wilson III will also be present for two huge signings with all these amazing creators in one place! The first signing will be held on Saturday from 1:00 pm – 2:30 pm and the next, Sunday from 3:15pm – 4:30pm. To help celebrate the tremendous signing C.P. Wilson III will be bringing some menacing prints with him from the new series Wraith: Welcome To Christmasland! On Facebook, Boston Comic Con made the following post. For all questions concerning refunds we are speaking with Eventbrite to try and expedite the process. Please give us a day or two to get a handle on it. Thank you. The convention was supposed to take place this weekend, but is obviously affected by the events transpiring around the Boston area. You can follow them for the latest updates. Boston Comic Con is in a little over a week, April 20-21 and 215 Ink will be there with their interesting digital products. In what’s becoming a tradition for them at conventions, they’re offering two exclusive deals at the convention which will get digital copies of their comics in fans hands. For less than the cost of a typical trade, 215 Ink will be selling USB sticks pre-loaded with every comic in their catalog, plus a selection of comic trailers from their YouTube site as well as digital versions of a limited-edition print run of comic covers previously offered. That’s a massive amount of comics on a handy USB stick. Not only is it a unique item, but that’s a hell of a deal. If you don’t want to drop the money on that, the publisher will also be offering $0.99 download cards, good for one digital download for you and one for a friend. 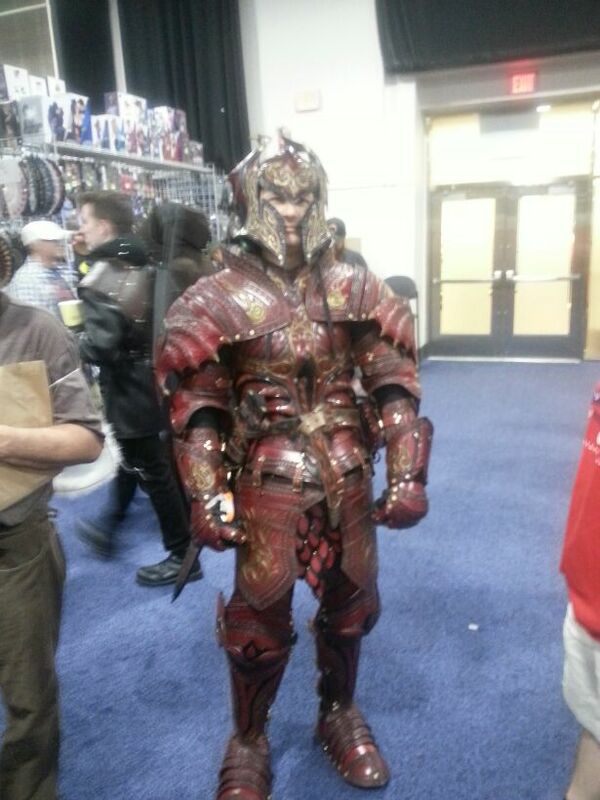 Boston Comic Con takes place at the Hynes Convention Center.